The financial world is a notorious pressure cooker. See how bankers and traders chill out. For Damian Handzy, science is king. "I subscribe heavily to the notion that the scientific way of thinking is largely what's gotten humanity to where it is today from the middle ages," said Handzy, Chairman and CEO of Investor Analytics, a risk management firm. 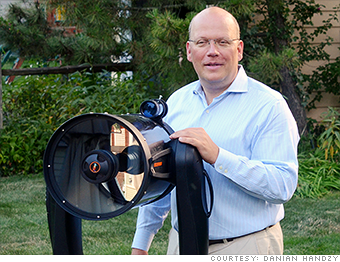 The nuclear physicist turned Wall Street risk mitigation guru spends his off-time time teaching astrophysics to students and scouts, a pursuit he finds both rewarding and stress-relieving. "I'm passionate about it, and I get to teach kids something. That feels great," explained Handzy. He maintains that his lectures are anything but boring, and he often holds Reddit style "Ask Me Anything" type sessions where students can inquire about any astronomy topic. "The kids really get into it. They want to understand this stuff. They ask some really deep questions," he said.